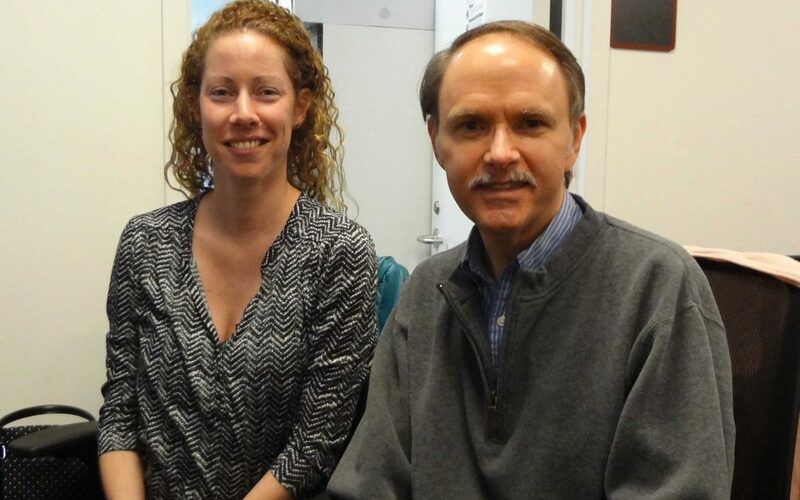 Bryan Pollard, President of Hyperacusis Research, recently visited the Polley research lab at Mass. Eye and Ear Infirmary, a Harvard Medical School teaching hospital. The research overview was led by Pooja Balaram, PhD, a postdoctoral fellow. The research lab focuses on the mechanisms and therapeutic potential of brain plasticity. The team works on projects ranging from basic research on neural circuit dynamics in the auditory cortex up to clinical trials of auditory rehabilitation strategies. Importantly, the lab leverages recent advances in two-photon calcium imaging, multi-channel electrophysiology and optogenetic methods to measure and manipulate genetically defined cell types in animal models. The team studies how normal auditory processing goes off the rails following hearing loss to create debilitating perceptual disorders, such as tinnitus and hyperacusis. Bryan met with Jennifer Resnick, PhD, who is a postdoctoral fellow working on the neural circuit mechanisms of cortical gain control after auditory nerve damage in an animal model. Jennifer received our Emerging Research Grant from Hyperacusis Research in 2017 (with our partner Hearing Health Foundation). For this work, Jennifer is exploring the role of central auditory system plasticity as a potential the cause of disorders associated with hearing loss. Specifically she is studying the brain’s compensatory mechanisms, after cochlear damage, which allow for basic sound recovery but also introduce chronic hypersensitivity, such as hyperacusis. Like most areas of the brain, the auditory cortex maintains an excitation and inhibition balance within its neural circuits. With a loss of input, these become imbalanced. In her experiments, Jennifer is specially targeting the loss of neural connections to the hair cells instead of hair cell loss as this may better represent the condition of many patients. Hair cell damage results in detectable hearing loss while a large percentage of neural connections can be damaged with no apparent hearing loss. In the upper left graph, the auditory nerve response to various sound levels is shown before and 30 days after neural damage. There is very little response at any dB level after the damage. However, the other graphs show that as you move up the auditory pathway in the brain to the Auditory Cortex (lower right graph), the dampened incoming signal has been enhanced to produce a response similar to the healthy condition. This shift occurs because of the change in inhibitory and excitatory neural balance. However there is quite a large variation in the results. Understanding why this balance can shift to a stronger excitatory mode may help uncover why only a small percentage of those with loud noise exposures get hyperacusis. This information can further enhance the potential treatments to reverse the imbalance. Pooja Balaram, PhD, is a postdoctoral fellow working on the genetic changes underlying increased central gain in a mouse model of sudden unilateral hearing loss. Her work focuses on calcium imaging and in situ hybridization of nRNA, underlying changes in the excitatory/inhibitory balance in the central auditory pathway. Pooja’s background in visual research provides a good framework to compare how the brain’s auditory responses compares to other sensory systems. A question she is pursuing is: “What tells the brain to stop compensating with the loss of neural inputs (such as in single sided deafness)?” Bryan asked about the speed at which the brain’s plasticity begins the compensation process. Pooja indicated that the neural changes can start within minutes – although the initial changes may not be noticeable. An opportunity for the future is to specifically work to determine whether the Type II fibers (which appear to carry pain signals from the cochlea) may also be overcompensating in the brain with hyperacusis with pain. Bryan initially met Ed Hight at the MEEI Gala event where he spoke as both a patient and researcher (Ed has had cochlear implants since he was young). Ed is a 6th year PhD student in the Speech and Hearing Bioscience and Technology Program at Harvard. Ed developed a special imaging method to track changes in cortical maps after acoustic trauma that causes a permanent threshold shift at high frequencies. For this imaging method, a window is placed above the auditory cortex (see images in picture below with Meenakshi) allows a large number of neurons to be studied at the same time. These advanced approaches for measuring neural activity will give important insights for both tinnitus and hyperacusis to further investigate the underlying causes. Bryan spoke with Meenakshi Asokan while she was working on active experiments. Meenakshi is a 3rd year PhD student in the Speech and Hearing Bioscience and Technology Program at Harvard. Meenakshi has been using a special imaging method to track daily changes in central gain from a select population of auditory neurons after a moderate noise exposure. The noise level causes only a temporary shift in thresholds but a permanent loss of cochlear afferent synapses. This better represents many hyperacusis sufferers who frequently have little to no hearing loss. Aravind Parthasarathy is a postdoctoral fellow working on the underlying neural signatures of auditory perceptual disorders such as tinnitus, hyperacusis and impaired processing of speech in noise. Bryan enjoyed discussing Aravind’s work, which uses a combination of EEG, psychophysics and pupillometry in human subjects. The key challenge with hyperacusis sufferers is to use approaches at the lowest possible decibel level for dection. One approach for better signal to noise ratios is to utilize frequency based responses rather than time responses based using Fourier transformation. For a more detailed description of the lab’s work see the Polley Lab website. Please mail to me information pamphlets with your address & phone &clinic name. My 27 year old son has been diagnosed with hyperacusis and tinnitus a few years ago. I have been reading your articles and am very interested in your research. My son needs help and I feel he could be of some help in studies your variety of Drs are doing. He is very healthy, he loves to work out, eats healthy meals most of the time and continually is trying to find help. He recently lost his job at a civil engineering firm because he wasn’t able to be a normal coworker. He complaines about people coughing, the way doors are closed, chairs moved around,scraping on the tile and even something as small as tapping a spooning on your coffee cup after stiring it. I have watched him completely crumble from a determined young adult in his early 20s to a discouraged and hopeless 27year old that’s feels lost and says he feels “BROKEN”. He’s mad at himself because he caused this. He is an eagle scout and has had gun safety. He went up in the mountains one day with friends to target shoot. He, for the first time, forgot to bring his ear protection. But went ahead and shot without it. He has had ear damage ever since. He had no idea what was ahead of him from that day on. He isolates himself now. He has made many friends uncomfortable and stopped coming around because of his hearing being painful and the reactions he has when they are loud or close doors with a slam. Opening a soda pop can set him off. I would like to have some help to make his life worth living again. I just lost my youngest child (Emily age 16) to cancer May 30th, 2016, I need my son to be happy so I can also live my life happy. I’ve been living with hyperacusis since radiation treatment for an acoustic neuroma/vestibular schwannomma in 2009. Cross talk, ambient noise in public settings as restaurants can disorient me so focused concentration becomes very difficult at times. Recently the “over-the-counter” hearing aid act has opened potential opportunities. I’ve tried noise cancellation devices from Doppler Labs and BOSE that purport to enhance conversation as well. Thus far, no success as my own voice when speaking, echos within my head. One can not sit around a table with others when distracted by many elements. Is research going on to satisfy the hearing/conversation aspects of my condition?